Calvin Goode is best known for serving twenty-two years as a Phoenix Councilman. He is equally proud of his many years dedicated to education. Mr. Goode was a baby when his family came to Arizona to work in the agricultural fields. He remembers picking cotton as a boy. Calvin graduated from eighth grade in Gila Bend, but the high school did not allow students of African descent. He says his mother really pushed education, “. . . even though she only went to the sixth grade. Dad went to the eighth grade, but he wanted us to go to high school and so we moved in order to go to school.” The Goode family moved to Prescott where their children were permitted to attend the schools. Calvin Goode attended high school in Prescott until, in his junior year, he became ill. The doctor thought he had a heart condition and predicted he might only live for a year. He remembers, “I was sixteen at the time and can you imagine, I was five foot, one inch and weighed seventy-five pounds.” His family decided to send him to Phoenix for his health. He enrolled at Carver High School, the only high school in Arizona built exclusively for African American students. During his senior year at Carver, he worked on the yearbook and was introduced to Black history. 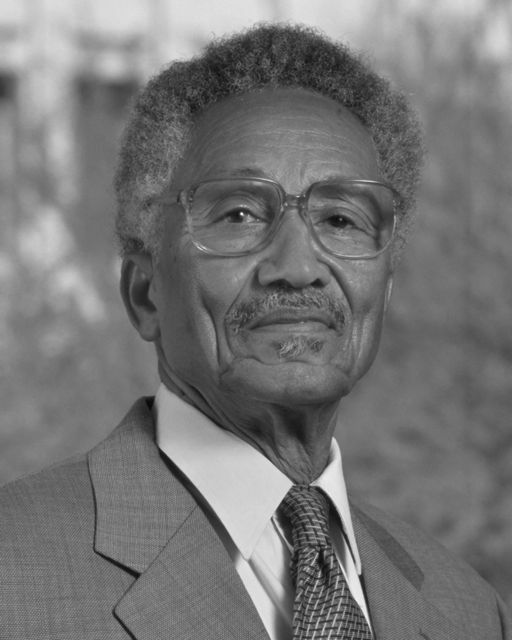 Calvin Goode graduated from Carver High School in 1945 and went to Phoenix College for two years. Following that, he enrolled at Arizona State University where he earned a business degree in 1949. Later, he earned a Master’s degree in education at ASU. Mr. Goode recalls it as a time when African Americans were not allowed to eat in many restaurants. Housing was restricted to certain areas, and jobs were limited. Mr. Goode returned to Carver High School as the school’s accountant. When Phoenix schools were integrated in 1954, Carver High was closed. Calvin Goode was then hired by the Phoenix Union High School District where he worked for a total of thirty years. In 1960, Calvin Goode married his wife, Georgie, who was a school teacher. They raised three sons and were both involved in a wide variety of community affairs. During that time, he served on the local school board and chaired the Phoenix LEAP Commission to improve education and job training opportunities. Calvin Goode was persuaded to run for a seat on the Phoenix City Council in 1971. Always soft-spoken, he says some people thought he was too timid to run for office, “They didn’t think I could win. But with the Charter Government Committee's help, and with my contacts made in the community, we put together a campaign.” He was elected and served for a total of eleven terms, a record twenty-two years. Mr. Goode was often called the “Conscience of the Council” because he used his voice to raise questions and pushed for improvements in neglected parts of the community. To commemorate his years of service to the city, the Calvin C. Goode Phoenix Municipal Building was named in his honor. During his retirement, Mr. Goode continues to serve his community. He is president of the Phoenix Elementary School Board and he worked on the transition committee for Governor Janet Napolitano. He still lives in central Phoenix in the home he purchased in 1955 at 15th Street and Jefferson. He’s active with the local neighborhood improvement association and Booker T. Washington Child Development Center, a Head Start program. Calvin Goode is also back walking the halls of his high school alma mater. He explains, “There was a lot of pride in the school. There are a lot of folks who graduated from Carver, not only in athletics but academically, who have achieved a great deal and what could be more fitting than where you went to high school, to bring it back as a museum.” The Carver alumni organization, led by Mr. Goode, acquired the old two-story building and is working to restore Carver High School to a place of pride in the community, as the George Washington Carver Museum and Cultural Center, showcasing the achievements of African Americans in Phoenix and Arizona.